Well, I’m not going to even discuss the issue of ‘cheap food’. I still think we can produce garden vegetables at a lower cost (again, we are not charging our own time) than we can buy them in the grocery store. But that is not the issue here. The issue is knowledge. Here in the US, we’ve just gone through a rather nasty fight in Congress where the Powers That Be in the food processing industry (and their friends the chemical companies and GMO seed producers) tried to get a piece of legislation passed that would prevent individual states from passing laws that require GMO ingredients to be called out in processed food labels. In Europe and other places, this is already a requirement, but the processed food industry had already ‘seen the writing on the wall’ and decided that if American consumers actually KNEW what was in their boxes, bottles and cans in terms of ingredients which had been derived from GMO, they would not buy the items and therefore, the sales figures would suffer. This move in the US Congress actually failed due to huge efforts on the parts of consumer education groups. Immediately afterward, General Mills, Kelloggs, Campbells Soup, and ConAgra announced that they would voluntarily label GMO ingredients and they would not raise their prices to consumers. Your old Aunty is not here to tell you what to eat. I’m just here to tell you what I eat and the fact that I prefer to grow our own stuff because I know that given how cheap and lazy we are here at Chez Siberia, no herbicides or pesticides have been sprayed on the garden and we prefer to use saved or organic seeds. That doesn’t mean that everything we grow in ‘certified organic’ (though we are moving in that direction). And here is one example: onions. Now, certainly we can pick up a 50-pound bag of onions at the grocery store, but something I’m certainly aware of is that onions (like potatoes) are sprayed with chemicals to inhibit sprouting. One of these is Chlorpropham, Sprout inhibitor. Now, we certainly are exposed to more than enough chemicals in our lives; being exposed to another chemical aimed at dis-inconveniencing us of the issue of sprouting onions and potatoes seems a bit much. So, we grow our own. We used to use onion ‘sets’ (which are baby onion bulbs). I thought they were the best thing going until I started buying actual onions plants. Now, these never look really very good, but once they are in the ground, they just take off and we’ve ended up getting more onions, bigger and better onions when we’ve used them. This year when I went to order them, I read the documentation twice: Not certified organic. 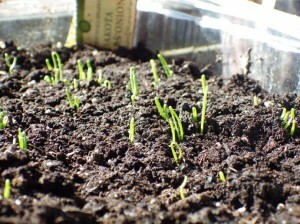 I looked all over the internet for ‘organic onion plants.’ No go. I could get certified organic onion seed, but no plants. So, like the Little Red Hen, I decided to grow my own. Certainly easy enough – no fussy out in our unheated greenhouse and not bothered by the occasional super-cold night because I had them on top of a heating mat. 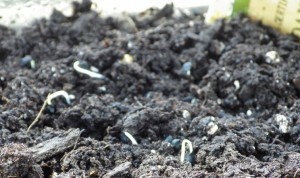 Within a week of planting, they were, as you can see from the photo above, germinating. And a few days later, They are really going. Once they get a bit bigger, I’ll transplant them into deeper media and we’ll have organic (the media is organic as well) onion plants to put into the garden. So, this is one reason why growing your own is worth the trouble – because sometimes, you just can’t find what you want in the format you want it. Hope everyone’s gardening is going well this spring!! I hate the fact that so many of our foods are grown with chemicals and other nasty stuff. I admire you for growing your own foods and your onions sound lovely!